A lovely conversation followed, she gave me a light hug, and wished me a “Merry Christmas”. Does it get any better than that? Was she a ghost of Christmas past? I prefer to think of her as an angel of Christmas present, sent to remind me of all the simple, happy memories of Christmas. Growing up, Christmas Eve was as big as, if not bigger than, Christmas Day. Christmas Eve centered around the Children’s Christmas Program at church. Weeks of practicing went into learning our speaking parts, Bible verses, and songs which we then presented before a packed house (of God). Good behavior and excellent effort was not only pleasing to God, our teachers, and our parents, it was pleasing to Santa, who apparently started his journey a little early over NW Iowa while we were at church. Not that we got to race home right after church to open presents … we first made a visit to Grandma’s house. No over-the-river-and-through-the-woods for us: I was fortunate enough to live in the same town as my grandparents. Grandpa and Grandma Hinkeldey lived in town and Grandma Glienke (my grandfather having passed away when I was very young) lived right across the road from our country church. We would spend Christmas Eve at one house and Christmas Day at the other, and then alternate days the each year. I have lots of wonderful memories of the Christmas season with my grandparents, aunts, uncles, and cousins on both sides of our family. Which brings me to the gumdrop tree. 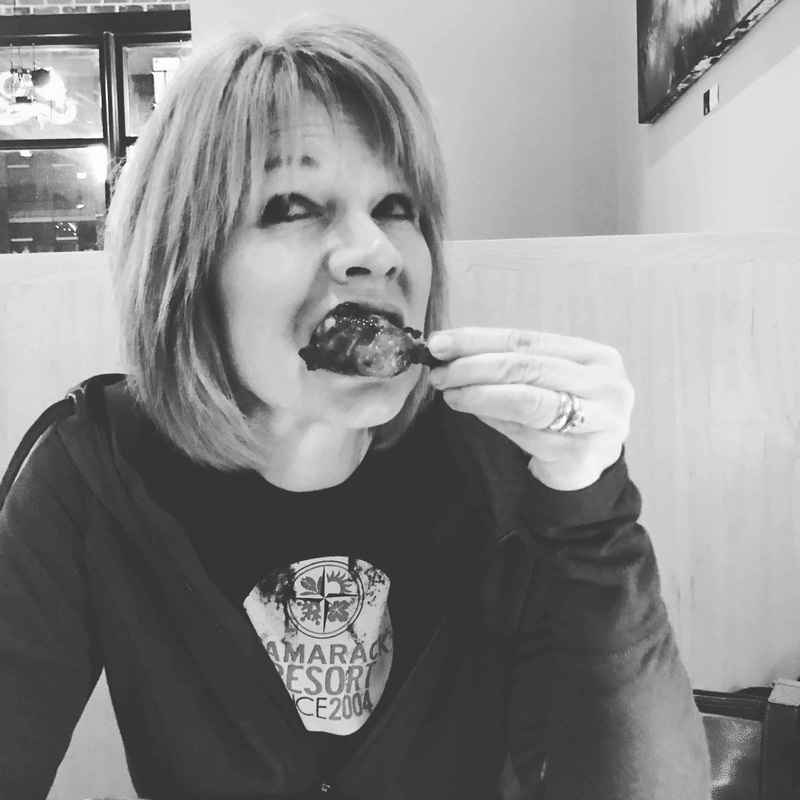 Isn’t it funny how something so simple, and yes, even a bit cheesy, could hold such fondness for so many years and end up becoming the subject of a food blog? 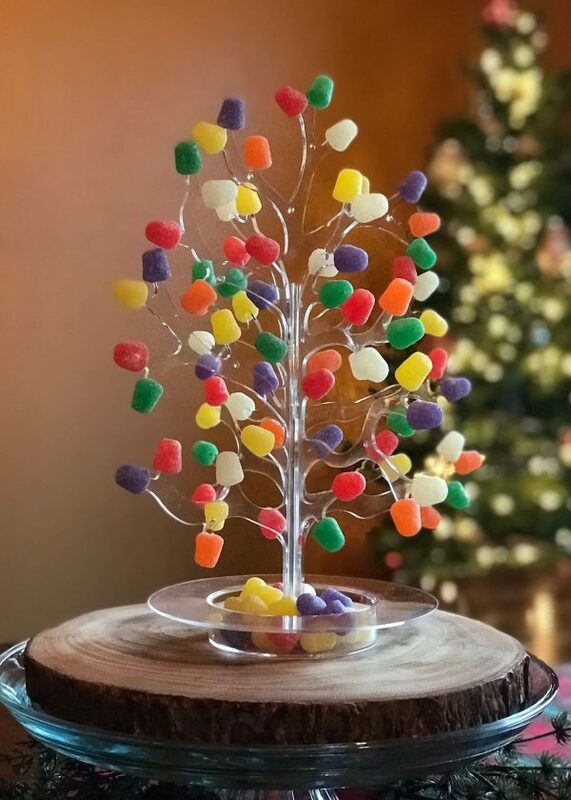 Every Christmas, Grandma Glienke would set out her gumdrop tree … a clear plastic form in the shape of the trunk and branches of a tree … and fill each branch end with a gumdrop. Around the base of the tree was a well that held extra gumdrops. This sparkling, sweet decoration could be found on her dining room table, a very solid oak pedestal table, all through the Christmas season. If you helped yourself to a gumdrop, you were expected to refill the empty branch with one of the candies from the base of the tree. 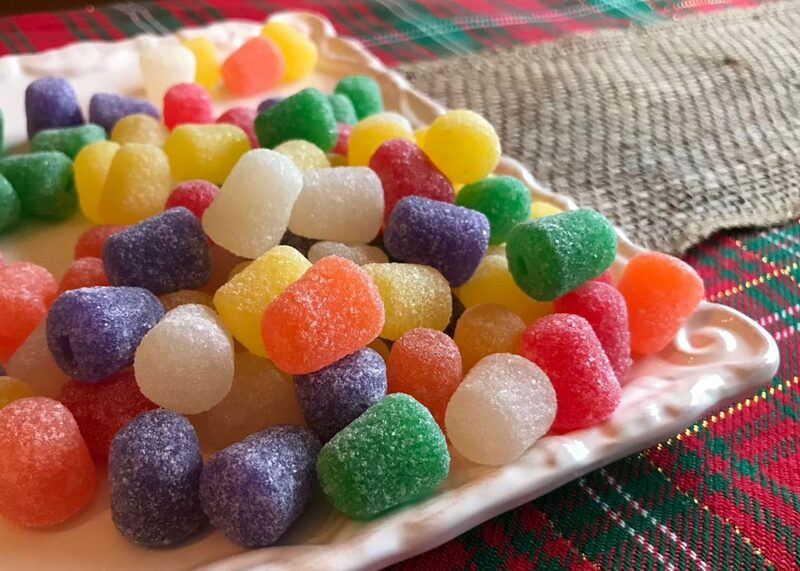 Be forewarned: when Grandma doesn’t get many visitors for a few days, the gumdrops tend to get a bit dry and chewy. I can only imagine how many bags of gumdrops she bought ever year. You were extra lucky if you happened to like the anise flavored drops … there were always plenty of those left at the end of the season. 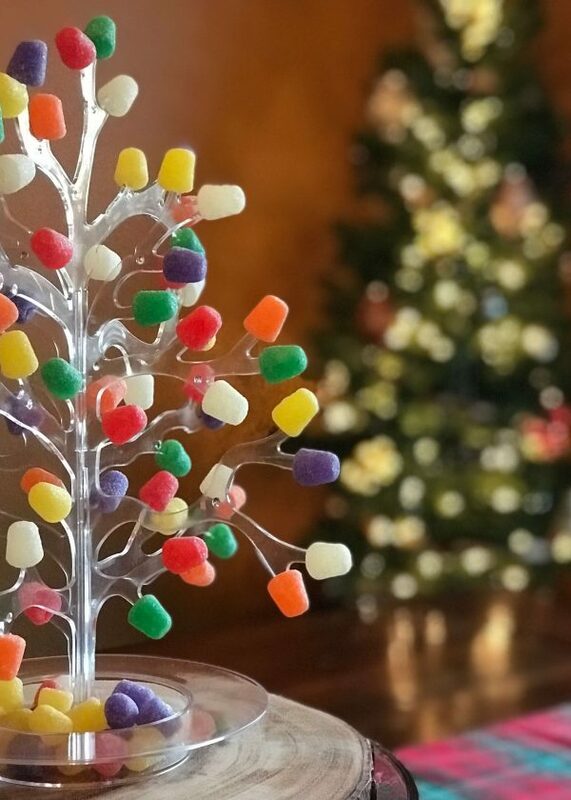 In fact, as I was placing gumdrops on my newly acquired tree (Amazon has everything), I quickly popped a red one in my mouth expecting the cinnamon burst only to be assaulted by anise. Why in the world would you make red the color of anise and not the color of cinnamon?? Why, I ask you? You know what else is safe? FUDGE! 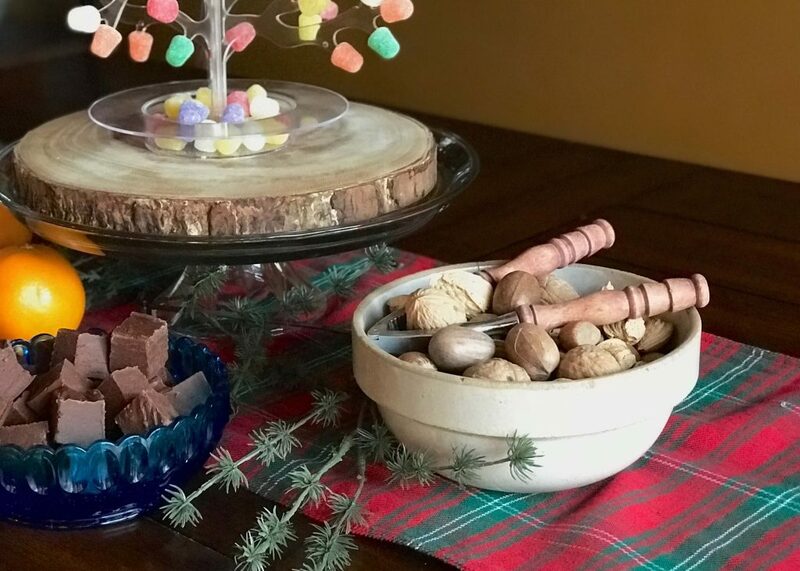 Next to the gumdrop tree would often be this bright blue glass bowl filled with fudge. 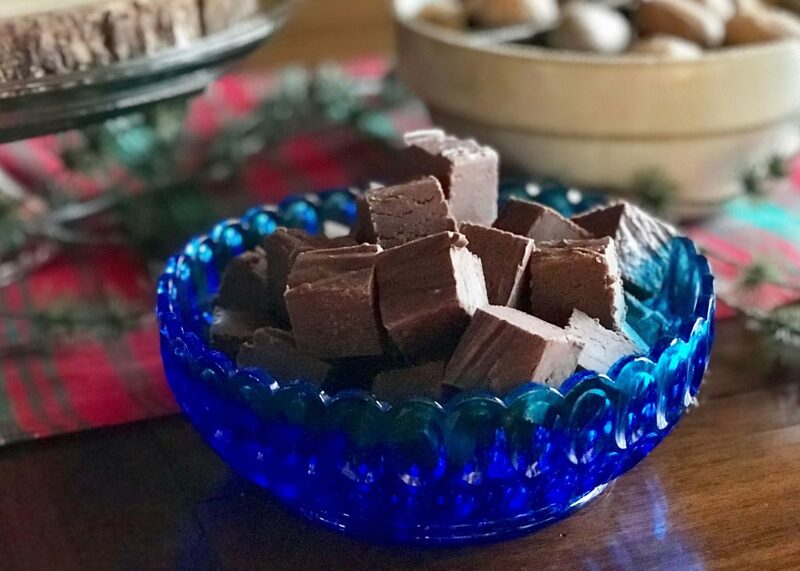 More about this pretty bowl and my favorite recipe for fudge can be found in a blog I wrote last year at this time. Every time I use Grandma’s blue bowl, it is a trip back to her house and the joy of the season. Oh boy was that joy loud! I must preface the rest of this story with one valuable piece of information. I have 44 first cousins on this side of my family. Granted, not all of them made it to her house on Christmas Eve every year, but I can honestly say that every couch, chair, arm of chair, door jamb, and square inch of floor space was filled. Beautiful, though not professional, harmonies would rise and even the kids were not in any hurry (even through about 7 of the 15 verses of From Heaven Above). I remember one year when I was pretty young, suggesting that we sing Jingle Bells and receiving a subtle head-shake from my mother. After all, that was not a hymn. But, the family was willing to amuse me and everyone sang a hearty verse. Before Grandma would hand out presents, those of us who had parts in Christmas programs were asked to stand and recite our parts … yet AGAIN. We did so, silently counting the number of years before we could join our older cousins who had aged out of the tradition. Gifts open and favorite hymns retired, we all made our way to the basement to eat! Grandma’s basement was far from the fully equipped family rooms with bars and big screens of today. A concrete floor and wood-paneled walls surrounded a long, open space filled with all types of tables and chairs. Mismatched card tables, wood and folding chairs, benches, and … you guessed it … even picnic tables sat at the ready for this crowd. Every table held a simple centerpiece … a bowl of mixed nuts, in the shell. Walnuts, pecans, almonds, hazelnuts, filberts, and peanuts … waiting for us to begin the work of cracking them open. Each table also provided one or two sets of nut crackers. Yes, we were a German family but please do not picture a wood figurine with a mouth that opens and closes and looks like a soldier. These nut crackers were hand-held silver tools that allowed you to place a nut between its arms and squeeze until the shell broke. The goal was to squeeze hard enough to break the shell but gently enough to keep the nut inside whole. Yes, we worked very hard to liberate nuts that we had no desire to eat. I think my grandma actually liked that … when the night was over, she had nut meats to use in her post-holiday baking compliments of free labor. The feasting was not limited to bowls of nuts, of course. A small room off the “dining hall” had been turned into a buffet filled with a potluck array of sandwiches, salads, cookies, and pies. If the singing was loud upstairs, the laughter in the basement would rival a small earthquake. … to grab just one more gumdrop for the road. May God bless you with happy memories, boisterous laughter, and sweet time with family and friends. Merry Christmas! So love your stories! Merry Christmas! Merry Christmas to you, sweet friend and mentor!! You have captured in print my exact memories. Thank you! (but what about those tiny glasses of wine? Raspberry, current, dandelion? Some were better than others. Who has those tiny glasses? 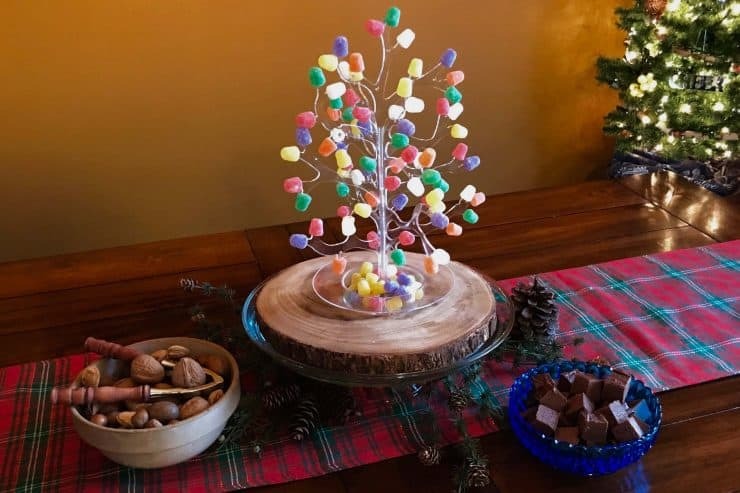 As for the gumdrop tree… it brings fond memories but I like the looks of the tree better than the taste of the gumdrops! Love that you found one on Amazon. I’d consider buying one just for the sentiment. I wish I knew who has them … I could fill my house with sentimental items. 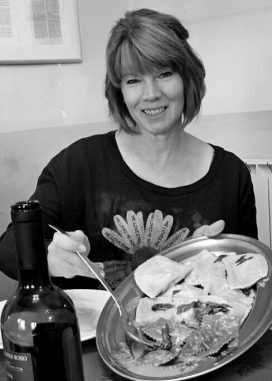 Most of Grandma’s wine was grape as she had those vines East of her garage but she definitely dabbled in the others too! Love your blogs!! I can picture the holiday at Grandma Glienke’s. 😊 Will we see you Christmas Eve? That’s still a part of our tradition, although the program is much smaller these days. Wishing you, Marty and the boys (men,I guess) a Merry Christmas and a blessed 2018. Marty & I will be there … boys are spending Christmas Eve with those sweet girls and their families! Thanks for sharing all those memories, Anita!